Nikola Tesla was a visionary Serbian-American inventor who transformed the world we live in today. Tesla was an electrical engineer, inventor and one of the most outstanding physicists in the history of science. He holds over 300 registered patents and is most famous for developing AC (alternating current), which powers the world today. 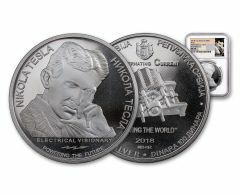 The 2018 Serbia Nikola Tesla Alternating Current Coin is a fitting tribute to Tesla’s AC invention that changed the world. Struck in 1 oz. of 99.99% fine silver, this is the first release in a new series celebrating the inventions of Telsa. The reverse shows a design of Tesla’s induction motor in careful detail. Above and below the design are the inscriptions, “Alternating Current,” “LIGHTING THE WORLD,” and “2018.” Surrounding it are additional statements in Serbian Cyrillic, along with the precious metal composition. This is the first time the Serbian Mint is striking a series of legal tender, bullion 1 oz. 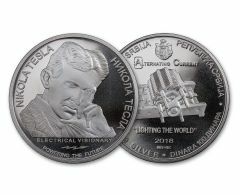 silver coins and each coin in the series will honor one of Tesla’s many inventions with a unique design on its reverse. Get started on your Tesla Coin series today. Nikola Tesla was a visionary Serbian-American inventor, who transformed the world we live in today. Tesla was an electrical engineer, inventor and one of the most outstanding physicists in the history of science. He had over 300 registered patents and is most famous for developing AC (alternating current), which powers the world today. Over a hundred years later, Quantum physicists are just now catching up with Tesla. His life work has become the basis of wireless communications, radar, laser X-Rays, lighting, radio wave broadcasting, robotics, free energy, weather manipulation, and many other areas we take for granted. His father was a Greek Orthodox priest who wanted Nikola to follow in his footsteps, but his mother saw his true genius potential early on. Though unschooled, she was highly intelligent and invented many ingenious devices for their home and farm. She encouraged his gift of creativity which blossomed at an early age. As a child, he displayed a remarkable imagination and creativity with a poetic touch. He spoke eight languages and had a photographic memory that allowed him to work with an almost effortless precision. As a student, Tesla displayed such remarkable abilities to calculate complex mathematical problems, that his teachers accused him of cheating. At 21 years old, he won a scholarship to an esteemed polytechnic institute in Austria and dedicated up to 20 hours a day in the study of science and mathematics. At 26 years old, he envisioned a new energy power solution, Alternating Current (AC) that was more efficient and practical than Thomas Edison’s Direct Current (DC). Tesla first got his foot in the door at Edison’s company in Paris, but soon realized he needed to move to New York to be able to work closely alongside Edison. Edison Hired Tesla and put him to work on his own DC inventions, completely rejecting Tesla’s idea for AC Power. The two men soon parted ways, and Tesla began to seek funding to see his inventions come to life. George Westinghouse, a wealthy entrepreneur, purchased Tesla’s patents and won the contract over Edison to show off Tesla’s AC power at the 1893 Chicago World's Fair, changing the World forever. Over the years, Tesla was obsessed with the wireless transmission of light, voice, pictures, and power globally in real-time. However, in 1901, Guglielmo Marconi succeeded first in sending a wireless radio transmission across the Atlantic Ocean, using 17 of Tesla’s patents. Marconi won the Nobel Prize for wireless radio, while Tesla ended up frustrated and broke. However, six months after Tesla’s death, the United States Supreme Court declared that Tesla’s patents proved that he actually invented the radio, not Marconi. Tesla had over 300 patents in his lifetime, many far ahead of his time. He was never able to live long enough to see his dreams reach the reality of today’s technology. In his later years, he became a recluse who died alone and penniless on January 7, 1943, at the age of 86. Upon his death, Tesla's apartment was raided by the FBI. Among his missing possessions, there are possibly hundreds of far-reaching creations that would have made the world the utopia of freedom that Tesla sought. The FBI confiscated all of Tesla’s notebooks and drawings, and they were never seen again.